I unabashedly love cake. And it pleases me to make it for others who share my passion for it. You know what makes me even happier? That I’m raising the bar for cake! My friends complain about other cake now or actually stop eating it. My advocacy of real icing and flavourful cake is having some impact (in a small circle)! Alas, I have yet to raise any bars related to cake decorating – I need to learn some new tricks. 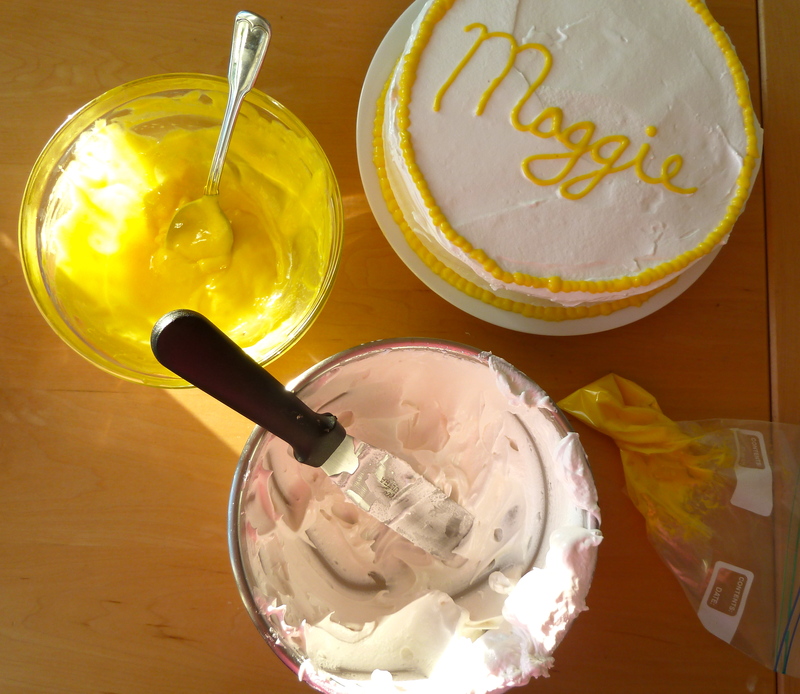 Anyways, this cake was for Maggie obviously. She requested lemon, same as last year. Excellent taste. Lemon curd has an awesomeness factor on par with pudding. Combined with 7 minute frosting and vanilla buttermilk cake we have a real winner. I probably should have split the layers and put lemon curd between two and frosting in the center, but I didn’t. Instead we just spread the extra curd liberally on our individual slices. Probably better distribution that way right? By far my favorite white cake, even if it never bakes up as high as I hoped. It’s moist, dense and surprisingly flavourful. Plus it comes together with minimal fuss. This is the cake I scaled up when making a wedding cake because it holds together really well. 1. Heat over to 350˚F. Grease pans and line with wax paper. 2. Put eggs, vanilla and 1/4 c. buttermilk in small bowl and whisk. 3. Combine flour, sugar, baking powder and salt in large bowl (use a stand mixer if you have it) and blend. 4. Add the butter and remaining 1 c. buttermilk to dry ingredients and mix on low to blend. Raise speed to medium and beat till fluffy, 2 min. 5. Add egg mixture in 3 additions, beating between each. 6. Divide into pans and bake for 28-32 min. 8 tablespoons unsalted butter, cut into small pieces, at room temp. 4. Remove from heat and let cool until warm, then whisk in butter, one cube at a time. 5. You can opt to strain or not (I usually don’t bother unless there are eggy bits) and then press plastic wrap directly onto the surface and chill until ready to use. Decide whether to cut your layers in half (by evaluating height of cake layers and your own willingness to deal with added hassle). If you decide to split, alternate a layer, then curd, then a layer, then frosting, layer, curd, layer. No splitting: just fill the center with a thick layer of curd. Then frost the entire thing and decorate with lemon curd. This cake benefits from sitting a few hours before serving to let the curd settle into the cake. Refrigerate before transport but serve at room temperature. Refrigerate any leftovers. This combination of cake, curd and frosting (or whipping cream) also makes a fabulous trifle if you have scraps and extra curd or just want to smash some cake. i got the “e”! And the frosting was so delicious this morning when I finished off the rest of the cake.